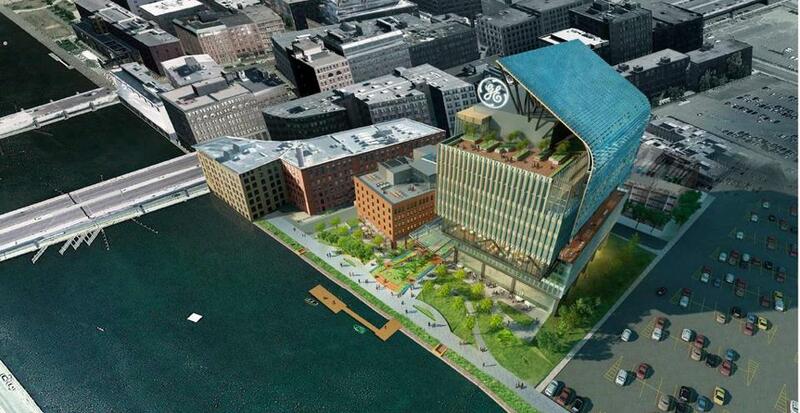 A rendering of the new headquarters General Electric plans to build along the Fort Point Channel. Marrying history with the future. 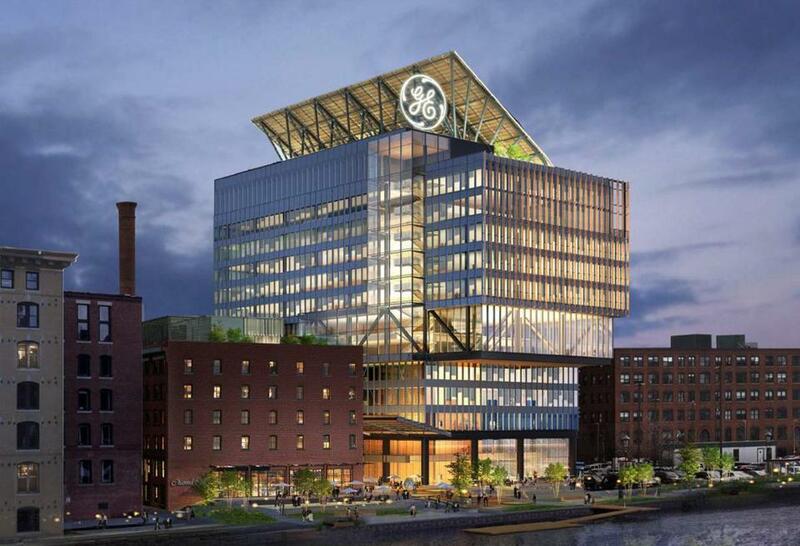 That was the charge that General Electric gave to Gensler when the industrial giant hired the architectural firm to design a new headquarters complex overlooking Boston’s Fort Point Channel. 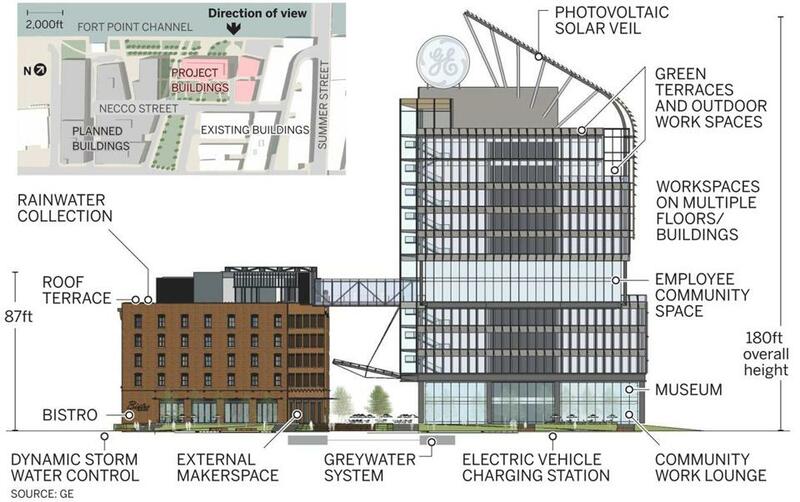 The end result: a striking 12-story glass building, topped off by a giant, sail-like solar “veil” and an illuminated GE logo, connected to two renovated, century-old brick warehouses. A key goal behind the nearly 390,000-square-foot project, as described in documents filed Monday with the Boston Redevelopment Authority, is to exemplify the massive shift within GE as it becomes what it calls a “digital industrial” company, one that focuses on how to make machines smarter and more connected. Only 16 percent of the complex’s space will be devoted to corporate headquarters offices — leaving room for startups, conference rooms, workspace for digital programmers. The ground floors of all three buildings will primarily be open to the public. GE will first renovate the two vacant warehouses at 5 and 6 Necco Court, and plans to start moving employees into those buildings in early 2018, with 800 workers eventually expected to be based there. In the meantime, GE corporate employees are moving from Fairfield, Conn., into temporary offices this month on nearby Farnsworth Street. 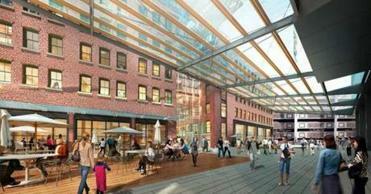 The brick Necco buildings will lose a floor, and gain a rooftop garden. These vacant, dilapidated buildings will be restored for offices, but they’ll go from six stories down to five. The reason? GE wants to elevate the ground levels by 4.5 feet to ensure they are protected from any flooding. The two brick structures will be connected by a shared glass atrium with a reception area, and the rooftop will feature a terrace with a garden area for “collaboration and relaxation.” The ground floors will host lab space where students can get hands-on experience with GE technology, along with a waterfront restaurant. On the top floor of one of the brick structures, there will be lab space for life sciences startups. As much as $125 million in state money could be used to help with the property acquisition and certain renovations and improvements, as well as the top-floor lab area. The new building will be anchored by a GE museum on the ground, and a conference room with stunning views at the top. 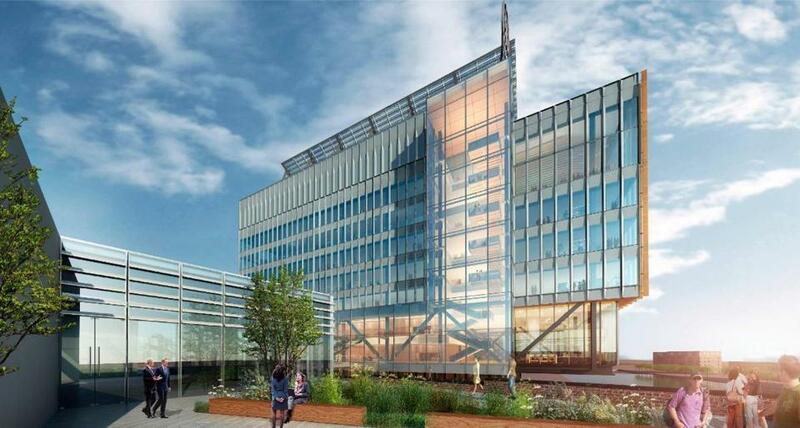 The ground floor and part of the second floor will showcase GE’s history and future. This museum, along with co-working space, a community lounge and coffee bar, will be open to the public. The upper floors will feature a mix of offices and “convener spaces,” including one room that can accommodate as many as 500 people, according to Klee, and open up to another rooftop garden. 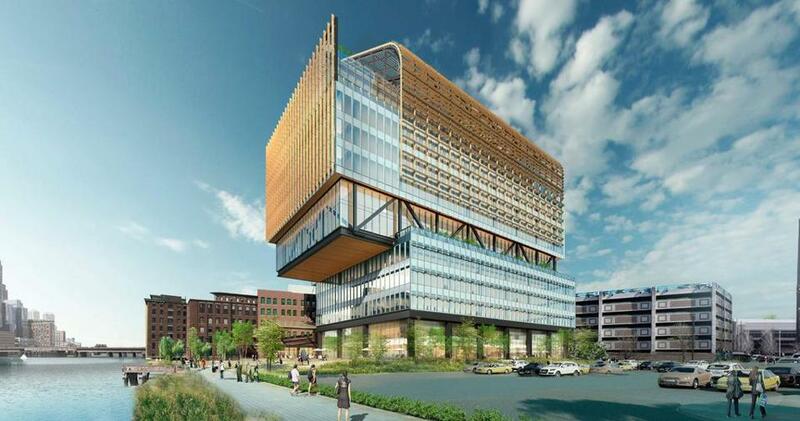 The new structure will be connected to the old Necco buildings in two ways: through a pedestrian bridge at the sixth floor, and through a plaza at the ground level covered by a glass canopy. Like with the old Necco buildings, the first floor will be 4.5 feet above the ground, to avoid flooding issues. That iconic logo will be a prominent fixture. GE is still working on the sign’s final designs. But the working plan right now is to build a GE “monogram” that’s 30 feet by 30 feet in size. The metallic sign, to be illuminated at night, will sit atop the new building and will be visible from downtown Boston. So will a giant “veil” of solar panels. The solar veil would curve over the south side of the building and its top, consisting of solar panels that can be replaced with more efficient ones as technology improves. The “veil” also will curb the sun’s heating effects on the building in the summer, reducing the need for AC. The property’s rock music legacy will be recognized. Klee said the new restaurant might have a section that pays homage to The Channel, the legendary music club that closed at the site in the early 1990s. There could be live music there on Friday and Saturday nights. No word on whether the Pixies or the Cars will reunite for a show.